This volume brings together prominent scholars from the fields of politics and international relations in order to explore questions of crucial importance to the creation of an effective, accountable and legitimate system of global governance. An exploration of questions of crucial importance to the creation of a legitimate system of global governance. Written by a group of prominent international scholars and experts of global governance. Provides a comprehensive analysis of major arenas of global decision-making. Evaluates the democratic quality of current efforts to manage global issues. David Held is Graham Wallas Professor of Political Science at the London School of Economics and Political Science. He is the author of Democracy and the Global Order (Polity, 1995), Models of Democracy (Second Edition, Polity, 1996), and Global Covenant (Polity 2004); the co-author of Global Transformations (Polity, 1999) and Globalization/Anti-Globalization (Polity 2002); and the editor or co-editor of Prospects for Democracy (Polity, 1993), Cosmopolitan Democracy (Polity 1995), Re-imagining Political Community (Polity 1998) and Governing Globalization (Polity, 2002). Mathias Koenig-Archibugi is Lecturer in Global Politics at the London School of Economics and Political Science. He is the co-editor of Taming Globalization (Polity, 2003). 1. Introduction: David Held and Mathias Koenig-Archibugi. 2. Defining Accountability Up: the Global Economic Multilaterals: Miles Kahler. 3. Disaggregated Sovereignty: Towards the Public Accountability of Global Government Networks: Anne-Marie Slaughter. 4. Multisectoral Networks in Global Governance: Towards a Pluralistic System of Accountability: Thorsten Benner, Wolfgang H. Reinicke and Jan Martin Witte. 5. Civil Society and Democratically Accountable Global Governance: Jan Aart Scholte. 6. Transnational Corporations and Public Accountability: Mathias Koenig-Archibugi. 7. Global Governance and Legitimacy Problems: Michael Zürn. 8. Global Governance and Communicative Action: Thomas Risse. 9. Global Governance, Participation and the Public Sphere: Patrizia Nanz and Jens Steffek. 10. Is there a 'Democratic Deficit' in World Politics? A Framework for Analysis: Andrew Moravcsik. 11. Democratic Accountability and Political Effectiveness from a Cosmopolitan Perspective: David Held. 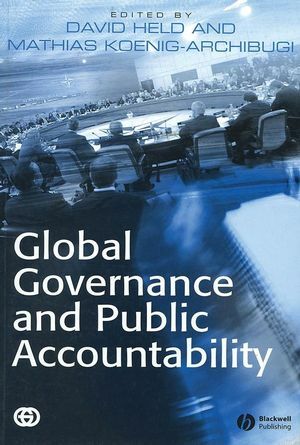 "This excellent volume raises serious analytical and normative questions of public accountability challenges posed by innovations in global governance, and it provides sophisticated, non-ideological answers. It marks an important contribution to the debate."